Stocky but deceptively fast and elusive and an outstanding tackler, Sid Dangerfield was equally at home on the wing or in the centre, occasionally showing his versatility by turning out at full back. He played 116 games for Gloucester between 1945 and 1950 and played regularly for Gloucestershire in that period, appearing in the 1949 County Championship Final. He also played for the RAF, Combined Services and British Police and for Gloucestershire & Somerset against the 1945-46 Kiwis. 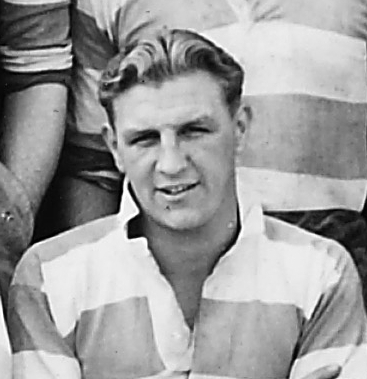 Sid Dangerfield joined Gloucester RFC when regular fixtures were resumed after WWII and played in Gloucester’s first game, against Bristol at Kingsholm, scoring a try in an 18-0 victory on 29 September 1945. The Citizen said “The Club have made a real discovery in playing Dangerfield who was the star of the match.” He immediately attracted notice and was chosen to play on the wing in Gloucestershire’s first county game after the war – a friendly against Somerset at Kingsholm on 8 December. However, he had to stand down when he was chosen as travelling reserve for the RAF for their match against the all-conquering New Zealand Army touring side (the Kiwis) at Leicester. He played a “heroic game” and was praised for his “fine tackling” in an 18-3 defeat by Cardiff at Kingholm on 9 February and on 16 February played for the RAF in a 9-6 win over the Navy at Twickenham. The following Saturday Dangerfield played for Western Counties (Gloucestershire and Somerset) against the Kiwis at Bristol “ tackling well and forming a good partnership with Francis Edwards”, although on the losing side. He continued to play well for Gloucester when available, notably in a fine 13-7 win over Northampton at Kingsholm and played for the RAF against the Army at Twickenham on 23 March. 1946-47 was a mixed season for Sid Dangerfield. He started the season with trademark tries against Lydney and Moseley at Kingsholm, both from a punt and follow-up. In the Lydney game he ran the length of the field to score. Dropped after the County Championship draw against Devon at Exeter in which he played in the centre with Daniell on the wing, he was restored to the wing for the game against Cornwall at Bristol on 14 December with Daniell in the centre. In an improved performance, Gloucester won 15-3 to go through to the semi-final. Later that month he toured France with Combined Services. After outstanding performances in Gloucester wins over Bath, Richmond and Blackheath, he missed a couple of games through injury, but returned to help the county win the County Championship semi-final against Middlesex at Kingsholm on 1 March. The following week he broke his leg playing for the RAF against the Army, forcing him to miss the RAF v Navy match and the County Championship final and ending his season. De-mobbed from the RAF and not required by Gloucestershire, he played a major part in Gloucester’s outstanding 1947-48 season, featuring in doubles over Bristol, Leicester, Bath and Moseley and wins in their only matches against Harlequins, Coventry and Richmond. He became a favourite with the Kingsholm crowd, standing out with his blond hair and characteristic leap in the air on scoring a try. Having joined the police force, he was unavailable for the first two months of 1949-50, returning to action at the end of October. This was a much less successful season both for Dangerfield and the club and he lost his county place as a result. He was not always available due to his police duties and may not always have been able to train with the team. He played for Gloucestershire Police against Devon Police and local club sides during the second half of the season. Nonetheless, he played 23 1st XV games and finished his season playing for Gloucester on the annual South West tour. Sid Dangerfield played against Lydney at Kingsholm on 9 September 1950 in the first game of the 1950-51 season, but this was to be his last 1st XV game for Gloucester. When he turned out for Lydney, who were hit by injury, at Stroud on 30 September the club secretary reported that he “had been given the club’s permission to play and would still be available for United games” which suggested that he had decided to step down from first team selection. He played for British Police against Neath in a trial game before playing against French Police at Newport on 14 October and continued to play for Gloucestershire Police for several seasons. A keen cricketer, he played for the British and Gloucestershire Police sides and was a stalwart of the Upton St Leonards club for many years, after retiring from the rugby field. Sid Dangerfield died on Christmas Day 1998 at Gloucester, aged 78.